This is a favourite dish of chinese and non-chinese alike. It’s so versatile. 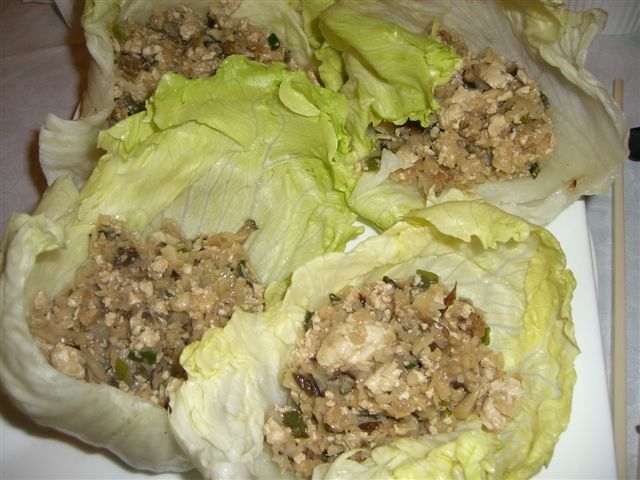 This recipe uses chicken mince, however you can substitute it with diced barbeque duck, pork mince, add in some prawns and omit the bamboo or water chestnuts. It’s great to cook for groups as you can make the filling ahead of time and prepare the lettuce - your food processor is your best friend. I made it as part of a 3 course meal for 90 people, as well as part of an 8 course chinese banquet for 8. Such an easy to make yet impressive looking entree! Clean or peel mushrooms and place in a single layer on an oven tray. Place half a teaspoon (or more if you can spare it!) of butter in the centre of each mushroom. I’ve seen Jamie Oliver use flavoured butter to do this – mixing herbs and chilli into it. Meanwhile, wash the rocket leaves and toss with the parmesan. Then dress with the olive oil and balsamic. Toss. Just before serving, stack the mushrooms on top of each other on a plate. Layer some rocket salad on top. Drizzle extra balsamic around the plate if desired. Season with salt and pepper.